What Homeowners Need To Do... Before, During & After Buying New Carpet! Many homeowners unknowingly make simple but Costly Mistakes when buying and selecting new carpet, tile and flooring. To make sure you make wise and informed choices, I have put together a simple Carpet Buying Checklist to help you understand and deal with some of the chaos that you might encounter. Do your carpet homework! Learn what makes one carpet better than another. 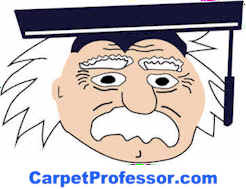 Take my free Carpet Foot Traffic Test to see what grade of carpet you should buy. Learn about scams and rip-offs you need to avoid and why buying carpet is so confusing. Do all interior painting at least one month prior or wait until after the carpet is installed. Shop for the grade of carpet you require first, then find several carpet styles and colors you like. Take several carpet samples home to consider your Best Carpet Choice. Get bids and estimates in writing and get every detail written down on the contract! Take your time choosing. Take samples home. How much does carpet cost? Take your time Choosing the Right Carpet Fiber and padding for your needs and goals. Keep the original carpet sample until after the carpet has been installed, for comparison purposes. Keep the original sales receipt and make sure the price of the carpet is shown separate from the price of the pad and installation. You will need this as proof of what you paid for the "carpet only" if you ever need to file a warranty claim. You always have the right to know the name of everyone who is working in your home. Write down the full name and phone number of the installer and the names of all his helpers. Ask for his State Issued Contractor's License Number if required in your State. Ask if he has a surety bond and business liability Insurance. You have the right to ask your installer for an insurance rider to be issued in your name and mailed or faxed to you prior to having any work performed. Discuss this with your carpet retailer prior to ordering your new carpet. This can provide you with added protection in some circumstances. When the installers arrive, check the carpet color and style to make sure it is what you ordered. Have furniture, wall pictures and knick-knacks removed from all rooms and areas to be carpeted. Make sure all valuables are put away safe and secure. Have all rooms pre-heated to at least 70 degrees, 3 hours before and during installation. Make sure kids and pets are safely out of the way in all areas to be carpeted. Never allow children or pets to roam free during installation. Do a walk-around with the installer and inspect the job thoroughly. Make sure all your concerns are addressed before the installer leaves your home. Get your installation warranty in writing. Obtain a copy of the New Carpet Warranty and Read it. Do not make the final payment until you are fully satisfied with the completed job. Read the manufacturer's Carpet Stain Warranty and follow all suggestions and requirements. Vacuum your carpet regularly. Spot clean as necessary. Never use bleach on your carpet unless it is recommended in your new carpet warranty. Consider buying a New Vacuum. Visit my Best Vacuums page to learn more. Keep all receipts for professional carpet cleanings, as they are required as proof of proper maintenance if you ever need to file a warranty claim. Always hire a professional certified carpet cleaning company. Never use a store-rented carpet cleaning machine to clean your carpets while under warranty. Always hire a Certified Carpet Cleaning Company. Learn more about carpet care and maintenance: How often should I have my carpets cleaned?